Our lightest warmth blanket is filled with luxurious white goose down spoiling you with all the comforts you’d expect from fine hotel bedding. It is finished off with a 2" satin border and is excellent for warm climates and for those who sleep warm. This blanket is fabulous. It is so soft and comforting. Keeps you snuggly warm and will also keep you cool. It is the perfect blanket. Just the right weight. If you sleep warm or live in a warm climate, our Hotel White Goose Blanket is an exquisite bedding option used in 5-star hotels worldwide. The soft 230 thread count, 100% cotton cover is filled with a 600 fill power of wonderfully fluffy Hyperclean® white goose down. This lightweight blanket prevents the discomfort of overheating yet still provides you with the cozy coverage you need for a great night’s sleep. It comes with a classy 2” satin border and features our sewn through box construction to keep the white goose down evenly distributed over you. As with traditional designs, our down filled blanket is finished with a 2” satin border adding a polished look and silky-soft feel. Down is the soft insulating material found on the breast of geese and ducks. Unlike feathers that have a quill, down has no hard elements. Considered one of Mother Nature's best insulators, a down cluster is a light and fluffy three dimensional spherical puff with multiple filaments that expand to trap air - giving down bedding its signature loft and cozy, embracing warmth. When used in comforters, down allows air to circulate around you contributing to a comfortable environment and deep, sound sleep. When used in pillows, down provides soft, adjustable comfort that conforms to your changing sleep positions. Pacific Coast® down is carefully sorted and selected to ensure that only the fluffiest clusters are used. 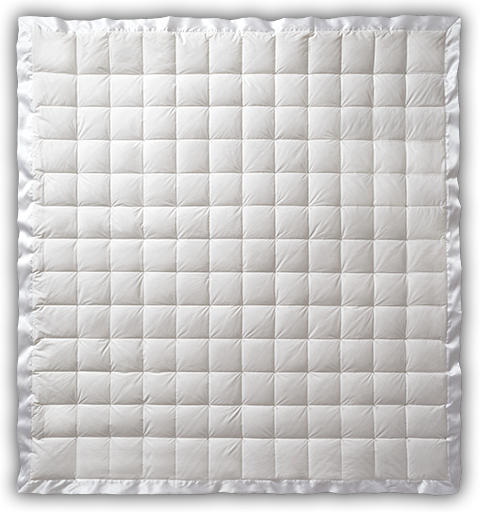 In our traditional sewn through box design, the top and bottom fabric layers of the comforter or blanket are sewn or quilted together in a large grid pattern. This design feature keeps the down in place and prevents it from shifting from one box to another so you can enjoy all over warmth and comfort. Our bedding products are made with a unique, tightly woven fabric weave that is specially finished to keep the down and feathers from sneaking through the fabric. This leak proof fabric is finer, softer and more durable for lasting comfort and easy care. Our oversized design ensures a generous drape that can also be tucked in like a traditional blanket.